There is still time to enter! Calling all cooks from the ages of 8-12 years old! You have until April 4, 2016 to enter for a chance to win a trip to the White House and the Kid' State Dinner with First Lady Michelle Obama. So far, there are no West Virginia entrants! You can change that- start creating. Enter a healthy MyPlate inspired recipe. One winner from West Virginia will be chosen; and the prize is priceless! 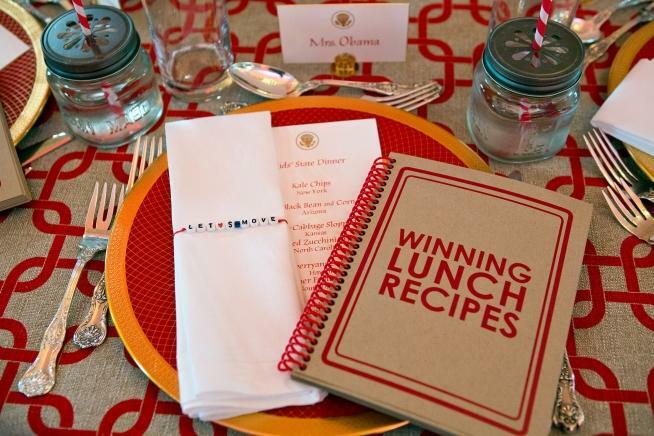 The winning chefs will serve as healthy food ambassadors for their state or territory and will be flown to Washington D.C. with a parent or guardian to attend the Kids’ “State Dinner,” hosted by Mrs. Obama at the White House this summer! Kids will also have the opportunity to learn from television personality and member of the President's Council on Fitness, Sports, and Nutrition Rachael Ray. In order to be eligible, your child, with the help and support of an adult, must create and submit a lunch recipe that follows the MyPlate nutrition guidelines: Fruits and vegetables should make up about half of the recipe or dish, and it should also include whole grains, lean protein and low-fat dairy. This year, in celebration of the MyPlate, MyState initiative, we’re encouraging entries to include local ingredients grown in your state, territory, or community. A parent or legal guardian is required to fill out the entry form on his or her child's behalf. Do you work with students in grades 3 to 5? Do you like to integrate technology into your lessons? Step up to the WVPB STEAM power WV Challenge and win a chance to earn cash to purchase technology for your classroom.